This trip is how the journey started, transforming us from casual city commuters to bike obsessed fully-loaded tourers. Before we conceived of this trip, the ride from our old apartment on Broadview Avenue to Toronto’s west-end felt like a respectable distance, now the eighty or so kilometres from our Toronto home to Alex’s family in Hamilton is a comfortable Sunday activity. Once we booked our flights another critical realization about the island set in, isn’t it, like, covered in mountains? Oh. We knew (*hoped* might be a better word) we could handle it, with a little training and careful planning. We also knew that our creaky, lumbering commuter bikes were not going to make the haul. The necessity to buy brand new, expensive bikes and equipment (two sets of panniers each, padded shorts, etc. 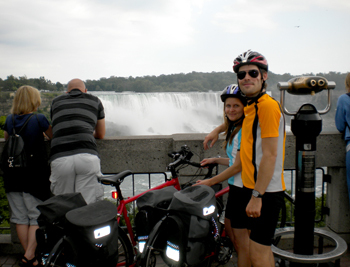 ), sealed the deal for us –cycle camping was going to become our long-term form of travel. Aside from the cost, the exhilaration of the ride and traveling sustainably under our own power just miiiight have been other motivating factors. We both did a ton of research and test rides to find touring bikes with a strong frame and gear set that could handle the weight and the hills but light enough to allow us to handle the weight and the hills! Apparently racing and urban commuter bikes are more lucrative markets in Toronto so there weren’t a ton of touring bikes to choose from within our price capacity of about $1000 each; Vanessa had significantly less choice as a woman tapping out at just below five feet tall. Despite doing separate research and independent trips to different bike shops we both ended up going with the KONA Jake. The Jake is a cyclo-cross bike, which means it is tough enough for trail riding, the frame is strong enough to support the weight we need to carry on trips but it still weighs in at about 28 pounds (? ), which feels pretty slight to us, at least when the gear is off!! Though the most important part of bike selection is not the specs or aesthetic (even if it is pretty and red like the 2009 Jake). The Jake just ‘felt right’ for both of us (positioning, gears, handling). Though a word of caution is in order for the vertically challenged and the ladies out there, Vanessa had far fewer options available to try. Often sales people would suggest bikes that they didn’t have in stock, like the Trek or Surly tourers. Sure the suggested bikes sounded great but without the chance to test-ride, Vanessa wasn’t interested in gambling away her bike budget. So while Vanessa loves riding the Jake and it’s a great buy for less than $1000 (we both added front and rear racks and the total came up to about $950 each), it’s not the ‘perfect’ fit –to achieve that at our price range and Vanessa’s stature is nearly impossible. As for route planning, we did some online research and contacted John Luton at the Vancouver Island Cycle Association, for less than $10 he mailed us out a Vancouver Island map along with a pile of local maps. While plotting our route we were perhaps overly cautious since it was our first cycle-camping trip. We decided on an average daily distance of approximately 50-70 kilometres, which in hindsight might have been a little too conservative. We could have covered much more ground each day, however, the purpose of the trip was to explore the island, visit different areas, and have a vacation! The short-ish distance allowed us to take our time in the mornings, stop for long (and large!) lunches, and get to know some of the people and places we met along the way. We also decided not to cycle the northern end of the island after we read many accounts of the scarcity of food and water available for cyclists; we love food and water! Stay tuned for our ‘during trip’ post to see the route that we actually rode. 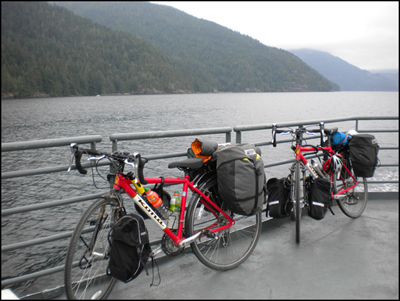 Ps- If folks are interested in more details on trip organization, bike selection, transporting bikes by plane, etc. please let us know.